I lived in Whitehawk Road at number 79 until I left the valley at 15 to join the army. Our house was situated right opposite the steps leading up to Findon Road. I well remember the great fun we had there playing on our ‘four nags’. Does anyone else remember them? Our neighbours were the Moon family, the Rhodes and the Stapletons; and on the other side there were the Lowers, the Buckles and the Kitchens families. 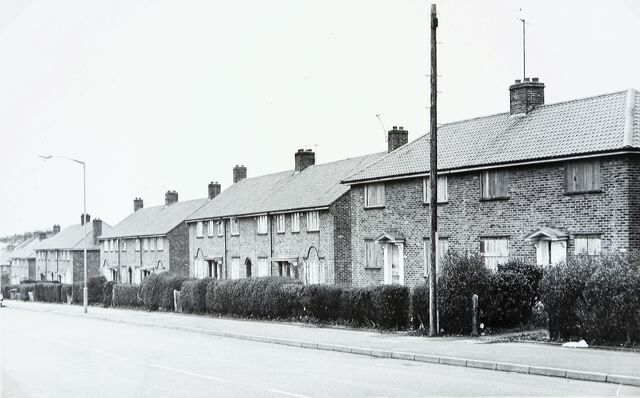 Does anyone else remember the prefabs on the opposite side of the road. The only two families who I can remember who lived in them were the Maxwells on the end by the steps, and the Berry family. I remember Robin with his mop of ginger hair who lived a few doors down the road. I went right through the Whitehawk Valley school system from primary to secondary. I sometimes think of Mr White the art teacher, and his strange three wheeled car which looked like a land based torpedo. There was Mr, Hyatt for woodwork, and Mr Bartlett who taught metalwork. My nemesis was without a doubt the science master Mr Stephens, who had a liking for rulers. The Whitehawk cross country runs up the hill and round the race course were legendary, and terrible to take part in. When you looked at that hill for the first time it struck fear into you. As kids, we used to make pocket money sweeping out the tour buses on the carpark, and also taking the drivers drinks of coffee in flasks. The Broadway Cafe and its well known cheery atmosphere and brilliant chip butties, was a great meeting place. What about ‘Ted’ the milkman? Does anyone can remember ‘Ted’ the milkman who delivered around the valley for many years? I used to help him with his deliveries on a Saturday morning. Perhaps you remember Mr Cracknel touring the valley with his horse and cart on his grocery round? What about Wilson’s laundry at Arundel Road? I got my first part time job there, it paid me 15/- a week. I used to walk over to East Brighton Park every week to watch Whitehawk F.C. I had to climb over the fence because I could not afford the entry fee. I well remember cheering on my favourite old winger Ron Bliss who I thought of as world class. Growing up in the Whitehawk Valley was definitely an experience, and set us up well for later life. It was very tough, but a fabulous place to spend our childhood. I have only returned to the Whitehawk Valley on three occasions since I left in September 1960. I now live in Scotland. However, Whitehawk was a place in which we experienced a childhood which I believe was second to none, and an experience which was unforgettable . I remember the four nags. Just about recollect Mr Cracknel, what a great place, those days. I lived at 123 Whitehawk Road opposite the junior school. I was one of 6 girls Betty, Winnie, Eileen, Brenda, Jean and Maggie. We used to come down the path at the top of the hill in our 4nag or on a roller skate with a book on. My father worked as the local coal man My parents Bet and Ted used to live in the prefabs when they first got married. My family were poor but we had a very happy childhood as all the families were the same. I left Whitehawk in 1971 when I married. I lived at 78, Whitehawk Road, my sister’s name’s Kathleen and my family knew Roy’s family next door to me. I also knew Roy’s brother Keith. Great times in Whitehawk as a child.